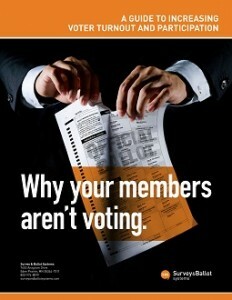 Why Your Members Aren’t Voting – We’re Giving You the FREE eBook! You know that elections are integral to the operation of your member organization and you’ve tried everything you can imagine to give them the opportunity to vote. So why aren’t many of your members casting their ballots? Our new, FREE eBook “Why Your Members Aren’t Voting: A Guide to Increasing Voter Turnout and Participation” reveals the reason many of your members have chosen not to vote and shares creative tactics to address the challenge. Ready to raise election response rates and engage with your members? Click here to get this free resource full of valuable, actionable information. Previous Previous post: How Can You Get Members of All Ages to Vote?